We would like to share our perspective on issues related to housing, land use, and transportation, as you prepare for your deliberations at the 2015 council retreat. Better Boulder supports sustainable urbanism in Boulder. We bring together members of the business community and environmental advocates to support changes to Boulder’s land use policies. We believe that more well-designed density, combined with a focus on sustainable transportation, can help Boulder meet many community goals – reducing carbon emissions, sustaining a dynamic economy, providing affordable housing, and providing a welcoming community for our young people and our seniors. Over the last year, we have watched with some distress as a number of council initiatives that had real potential to make a positive difference in the community have slowed or scaled back. These include the comprehensive housing strategy, with the lack of action on the proposed “early wins”, and the reduction in scope of the East Arapahoe plan to not even evaluate scenarios involving significant increases in intensity along the corridor. We were disturbed by the effort to impose a broad development moratorium. At the same time, we have been encouraged by some changes taking place on the ground, most notably by seeing years of community planning efforts start to come to fruition as the Boulder Junction area develops. And we are delighted to see major employers like Google choosing to locate in the transit-rich core of boulder rather than in a suburban office park. We encourage you to continue to support transit oriented development in this vicinity, including both housing and employment. We would also encourage you to go further in ensuring that development that is approved in this area is truly transit oriented – with vibrant pedestrian oriented streetscapes, lower levels of parking, and true unbundling of parking costs. We are also encouraged to see the city engage Victor Dover in efforts to improve the character of new development. We would ask you to consider a number of perspectives as you set your 2015 policy agenda. 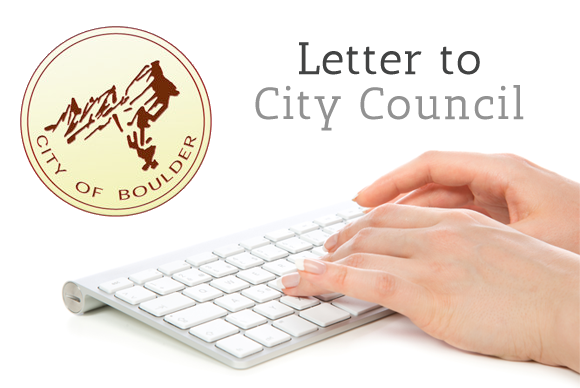 As the city looks at issues like the BVCP update, the East Arapahoe plans, and the future of Boulder Junction, be willing to think boldly about land use changes. This is an opportunity to look at both bringing additional housing and economic activity to the community, and to reshaping areas into far more vibrant, pedestrian friendly neighborhoods. We support a vigorous, inclusive public process to explore the implications and tradeoffs. We support the city look at loosening code restrictions that have made it so difficult for people to share their houses, whether through cooperative housing or accessory dwelling units, cottages, and granny flats. We would encourage you to be willing to experiment in this area. Don’t insist on rules that try to prevent every conceivable problem – instead create some reasonable rules, monitor how they work, and make adjustments if necessary. Please don’t allow fear and over-regulation to prevent ordinary people from finding creative ways to afford to live in Boulder, while lowering their footprint on the planet. We also encourage the council to think bigger about the comprehensive housing strategy. We have the ability to add enough new housing to our community to make a real difference; the idea that we can only tinker at the margins is a self -imposed limit. There is no reason that the city could not add thousands of units in existing low density commercial areas and parking lots, using density bonuses for affordable housing to ensure that these units serve a range of incomes. On the big scale, we need to make infill more attractive for development than sprawl We also need to capitalize on one of the great advantages of infill – that many needs can be met without driving, and we don’t need as much money spent on parking and roads. We support using the AMPS process to significantly reduce minimum parking requirements that get in the way of valuable infill projects that could serve our community. We can build parts of our city that have very little parking, and we will attract residents who want to love car-light lives. We are concerned with the potential implications of the direction to focus more on engaging “neighborhoods” in planning discussions. The problem is the limited meaning that is sometimes given to this term – an implication that neighborhoods means owner-occupied single-family homes.. These are the folks who are most likely to be already engaged and represented in the process. We would encourage you to use the new neighborhood liaison position to encourage input and involvement from residents of multifamily housing, renters, mobile home residents, young people, our Latino population, and others less likely to already be heard in the process. When looking at climate goals, remember that what really matters is how much we can reduce GHG emissions per capita. Diverting growth and associated emissions outside of the city does nothing for climate. GHGs are globally mixed gases – it does not matter whether they are emitted in Boulder or elsewhere. Denser land use will both reduce per capita transportation emissions, but also will lead to more people living in smaller units in multifamily housing, reducing building related emissions. And, concentrated, denser areas of employment lead to far higher alternative mode shares and lower per capita transportation emissions from employees. Thanks for the opportunity to comment. We look forward to working with you in 2015.